5 Days for the Homeless – Hill Business Students' Society | Engage. Enrich. Excite. 5 Days for the Homeless was started by business students from the University of Alberta in 2005. Their mission was to generate awareness about homelessness, raise monetary donations for local charities around the country and to change the image of business students. During this event, student participants experience homelessness for five days in early March, in hopes of achieving these goals. Since its inception, this movement has expanded from a local movement at the University of Alberta to a national campaign with 19 other universities throughout Canada joining in. This past year, over $200,000 was raised nationally and the Paul J. Hill School of Business raised over $52,000 (the highest raised across Canada, ever!). This year, our campus-wide goal is to raise $50,000, with all funds going to our local partner, Carmichael Outreach. Carmichael Outreach is a non-profit organization in Regina, Sk. They offer emergency services and long-term supports with a goal to end the chronic experiences of poverty and homelessness in our city. Carmichael focuses on strong community values including respect, dignity and empowerment. We invite all of our Friends of 5 Days, to join us on Sunday March 18 at the Wascana Country Club to kick off our 5 Days for the Homeless campaign. We will have drinks, appetizers, and even better company. There will also be local talent performing for this great cause. This event is great opportunity to socialize with like minded ‘change makers’ in our community- and to learn a little more about Carmichael Outreach. Entrance is by donation, and every dollar we fundraise throughout the night will be donated to Carmichael Outreach. Come out to the Owl and for only $5, enjoy a night of trivia! Tickets available at the door! Grab your friends and head down to Browns Social House East for a burger! Each $25 ticket includes a meal, including any choice of side and a beverage of your choice! Come enjoy a spin at the Wheelhouse Cycle Club! We will be downtown Regina on Thursday, March 21st to collect monetary donations for Carmichael Outreach! This is a great opportunity to meet our 5 participants and students of the University. We will have entertainment and Tim Horton’s coffee! Our fifth annual Lip Sync Battle is back and better than ever! Come on out and watch people perform! In between lip sync’s you will have a chance to donate money to have your friends perform a karaoke song of your choosing! Just in the mood to enjoy the show? Kick back, relax, and buy an immunity bracelet at the door. Tickets are $5 and an immunity bracelet is $15! Apply to be a performer here! Join us on Friday, March 22nd, at our closing press conference to wrap up the incredible week. Come and help us celebrate and thank our wonderful volunteers! Interested in Sponsoring 5 Days for the Homeless? 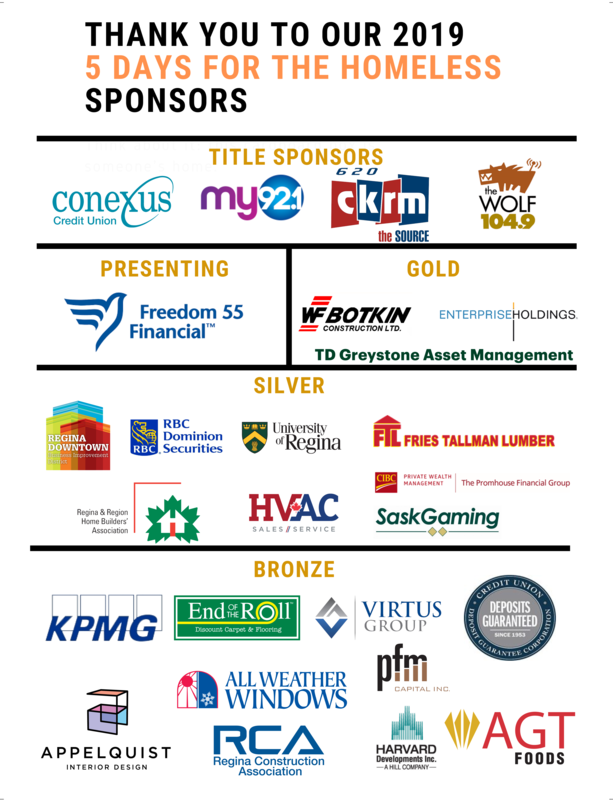 We wouldn’t be able to host the amazing events we do without our wonderful sponsors. If you’re interested in sponsoring this year, click the button below to contact us!